To start the MySQL Cluster Manager agent manually on a Windows host, you should invoke mcmd.exe, found in the bin directory under the manager installation directory on that host. By default, the agent uses etc/mcmd.ini in the MySQL Cluster Manager installation directory as its configuration file; this can be overridden by passing the desired file's location as the value of the --defaults-file option. 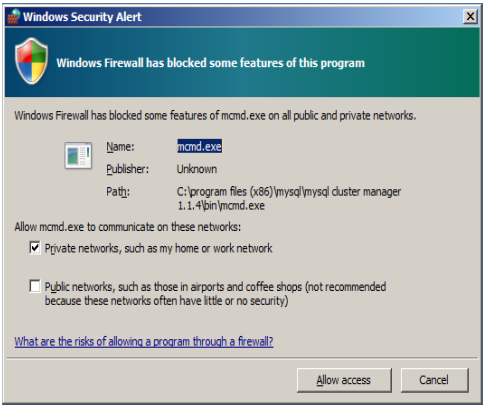 You should grant permission to connect to private networks for any of the programs mcmd.exe, ndb_mgmd.exe, ndbd.exe, ndbmtd.exe, or mysqld.exe. To do so, check the Private Networks... box and then click the Allow access button. It is generally not necessary to grant MySQL Cluster Manager or MySQL Cluster access to public networks such as the Internet. The --defaults-file and --bootstrap options are mutually exclusive. It is possible to install MySQL Cluster Manager as a Windows service, so that it is started automatically each time Windows starts. See Section 2.5.3, “Installing the MySQL Cluster Manager Agent as a Windows Service”. To stop one or more instances of the MySQL Cluster Manager agent, use the stop agents command in the MySQL Cluster Manager client (see Section 3.7, “The stop agents Command”, for more information and examples). You can also stop an agent process using the Windows Task Manager. In addition, if you have installed MySQL Cluster Manager as a Windows service, you can stop (and start) the agent using the Windows Service Manager, CTRL-C, or the appropriate NET STOP (or NET START) command, as discussed in the next section.